Call of Duty Advanced Warfare has arrived, and after the highly disappointing CoD Ghosts, we’re pleased to report a fantastic return to form for the CoD series. 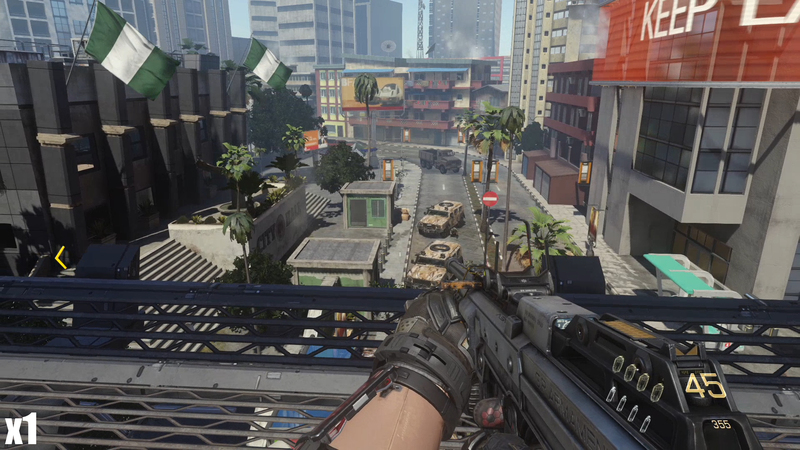 Advanced Warfare plays better, looks better and frankly performs better across all platforms compared to its predecessor. While it’s not quite up there with the best looking games available on each platform, there’s few who’ll disagree that the lighting, character models and animation are a great step forward for the Call of Duty series as a whole. Firstly – let’s address the resolution question. 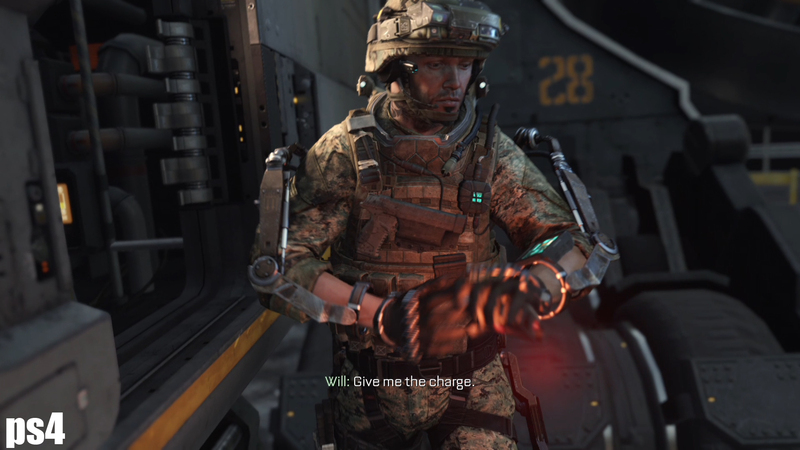 It was unveiled by the developers the Playstation 4 version of CoD Advanced Warfare would indeed run at the full native resolution of 1080P. The Xbox One version however isn’t quite so fortunate, and sports a ‘dynamic resolution’ which will render at at least 1360x1080P. What this means, for all practical purposes is the resolution of the Xbox One can go between 1360×1080 sll the way up to full 1920x1080P goodness. With Sledgehammer aiming to stay as close to 60FPS as possible, it leaves the GPU only 16.67ms of render time per frame of animation. 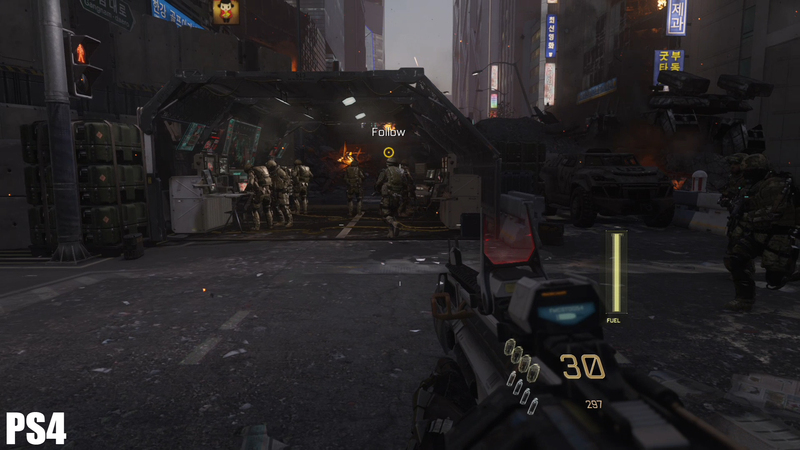 Thus, Advanced Warfare’s engine decides which resolution to render each frame based on the load the title is putting on the console at the time. In practice, this can mean at its best, the Playstation 4 and XBox One versions have the same pixel count, but at its worse, the Xbox One version is sporting a lower pixel density than its rival. While some will argue that it’s a very “PR” friendly way of avoiding 900P, there’s no denying that in practice, 1360x1080P is still a higher pixel count than 900P. 1,468,800 pixels versus 1,440,000, a difference of a ‘mere’ 28K, but still, it’s a higher number. This difference in pixel count is roughly explainable by the raw shader power difference between both machines. 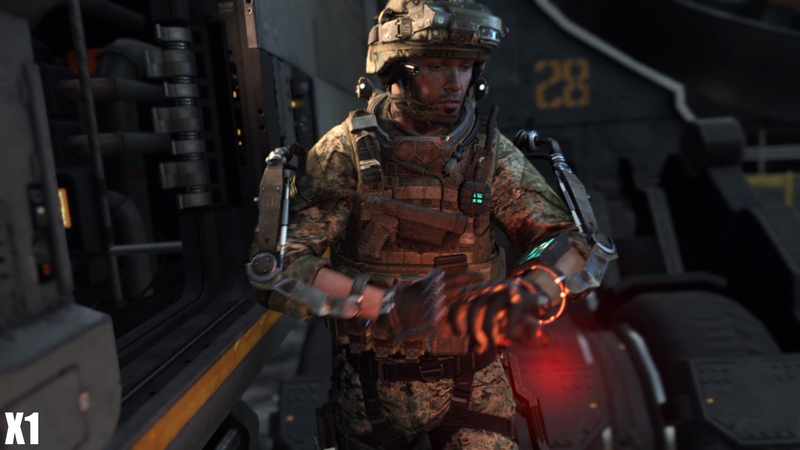 The internal resolution of the Xbox One’s version of CoD is therefore rendered oftentimes at a lower resolution, leaving the Xbox One’s upscaler to do its work. A strange point concerning color of the game – the Xbox One version (at default gamma values) is considerably darker than the Playstation 4 or the PC iteration. When recording the initial footage for the game, as usual I configured everything to be default, which was perfect for the other two versions of the game. Having recorded the PS4 version first (purely because it happened to be the system plugged into the recording equipment at the time), I was watching my gameplay to replicate it on the Xbox One. Within just a few minutes I realized the image looked very different. Switching back to the PS4 version, just to ensure I’d not screwed up the gamma values, then doing the same to the Xbox One version, and nope – the coloring for the Xbox One is considerably darker. You’ll be able to fix the issue by boosting the value between four to five notches. More than that and you’ll quickly start blowing out blacks, obviously not ideal for visual quality. 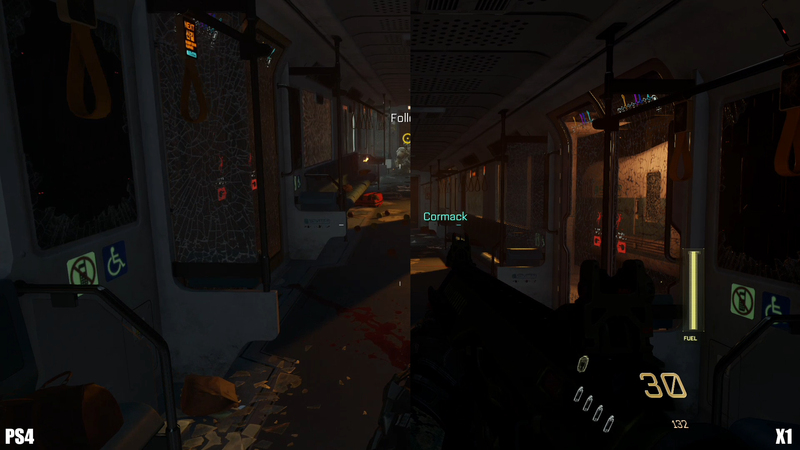 Fortunately, despite having to manually alter the gamma, the Xbox One version doesn’t blow out the blacks. Careful analysis of a few areas of the game, and then comparing them to the Playstation 4 default values produces pretty much like for like results. Unlike some Xbox One titles, RGB values can (and do) start at the an RGB value of zero for all three channels, but in other areas dark greys are present, at various hues for shadows. Examples include the train near the beginning of the game. In both console version of the title, the railing and seat coverings feature very similar color values. A post process Anti-Aliasing is used to help rid the world of jaggies, but its far from perfect. It would appear both the PS4 and X1 are using the same post process technique, likely FXAA to help smooth out the image. FXAA isn’t perfect in the title, and indeed oftentimes parts of the image are left looking step-laddered. In other words, FXAA has the habit of missing parts of the image, or, blurring parts of the image a little too much. Examples can even include some of the gun being ‘smooth’ and further down the barrel appearing pretty darn aliased. It’s not an ideal situation, and while we’d love to see a better AA mode used, reality is that there’s only so much GPU power to go around. While there are some who’d argue using FXAA is worse than having no AA at all, from a personal standpoint, I’d disagree with that. It’s worth noting that the Xbox One version suffers slightly worse than the Playstation 4 at times, likely because of the flickering resolution. 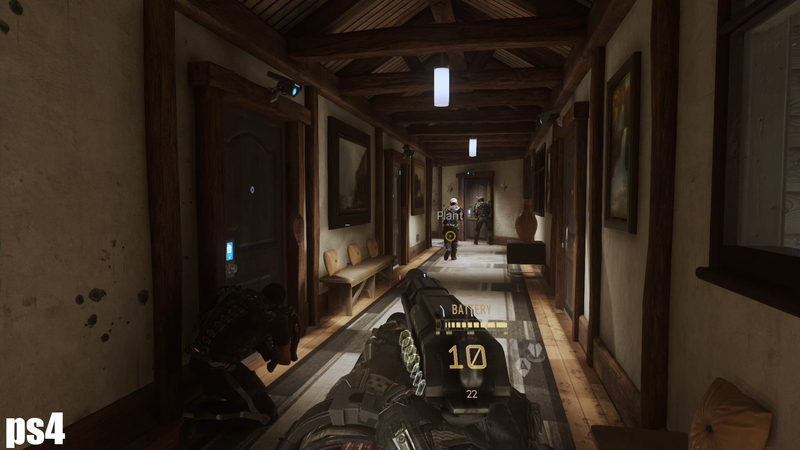 Textures in the game are certainly a welcome improvement over Ghosts, and they’re created in a fairly reasonable too. Signs, billboards, walls and even debris and waterbottles are all readable. Sure, some textures can look a little less stellar, but as a whole, both the Xbox One and Playstation 4 iterations of the title hold up extremely well. It’s hard to notice any difference in texture quality across the consoles, and we’re reasonably sure they’re using pretty much the same assets. Even the mighty PC doesn’t really seem to benefit from much better textures (particularly true if you’re running at 1080P), but the PC version of course can run with much better Anti-Aliasing and texture filtering. The AF alone can certainly help add a nice level of sharpness to the textures. From the standpoint of animation and models, there’s little in it. 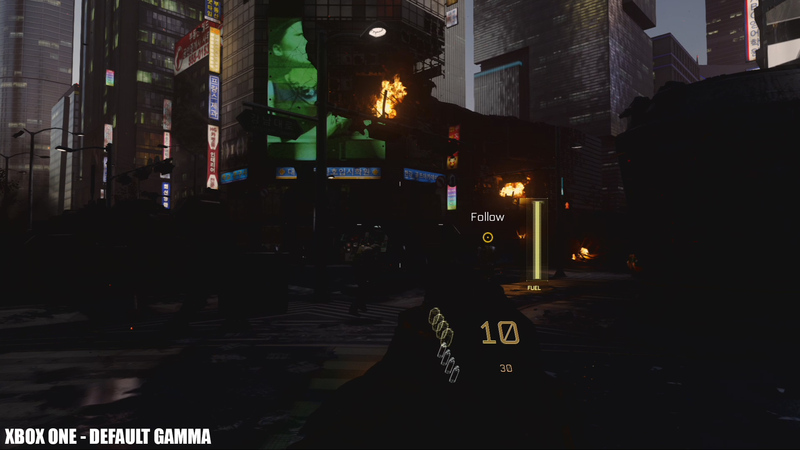 The Playstation 4 version is pretty much identical to the Xbox One’s. This isn’t really surprising, but it’s nice to know. Objects such as plant pots, foliage and even the fairly infamous water bottles all look pretty damn similar to each other. For a more general point of view, foliage in the game can look a little worse than other elements in the game. We know by now that grass, leaves and other organic surfaces can be quite costly to render. Both because of their levels of complexity for the organic shapes, and the high GPU cost to render them. 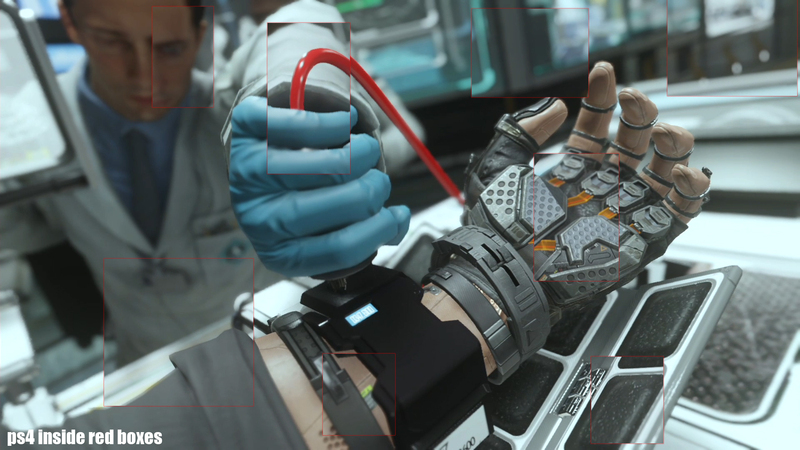 Performance is a bit of a sticking point for the Playstation 4 – the campaign proving to be particularly tricky, with the frame rate falling into the low 50’s much more frequently than the Xbox One. Coupled this with the occasional bit of stuttering, and the Xbox One version does play a little smoother. While this is a win for the Xbox One, it’s not sunshine and lollipops when you factor in the lower internal resolution. For campaign you’re left with the decision “would you prefer higher resolution, or higher frame rates?”. If your answer is “both, please!” then really the PC is the only option. 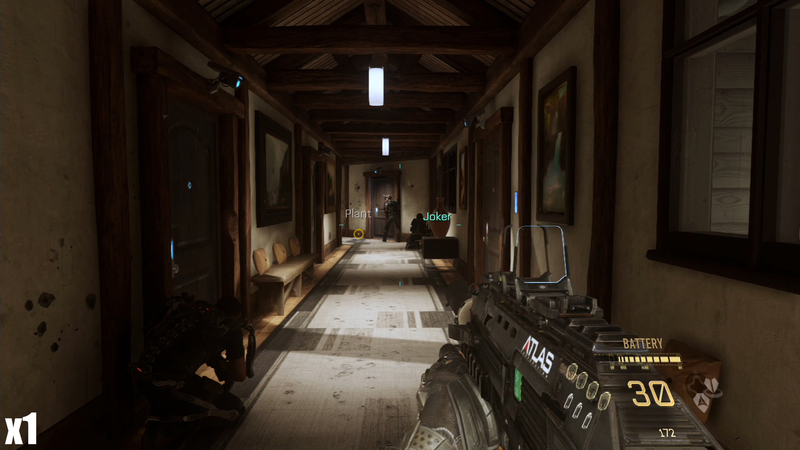 For multiplayer, the PS4 fairs a little better. 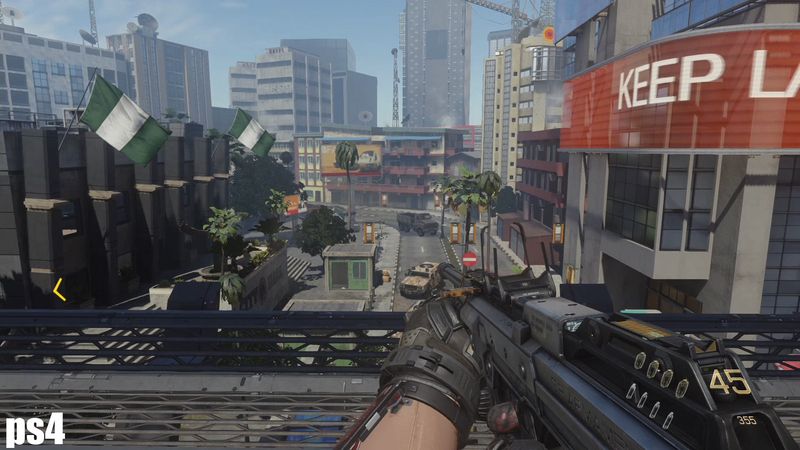 Frankly, latency associated with a lower frame rate isn’t conducive to great gameplay, and thus Sledgehammer have optimized multiplayer maps to ensure better frame rate. Frame rate and overall ‘feel’ of the two versions are much closer. The win from a graphics perspective thus must go to the PS4, purely because the X1 is still running at the lower internal resolution. While both versions can dip below the 50FPS mark, it’s a rare sight. The majority of the time you’ll see the frame rate clinging to the 60FPS mark, unless there’s a lot of death and destruction going on at time. The usual culprits apply – large explosions, particle effects, massive on screen effects or characters, or very heavy lighting effects. You’ll see the Xbox One version slightly on top, but that’s because it sacrifices its resolution if the going gets tough, as we’ve discussed above. I think it’s a pretty safe bet there’ll be few among you who’ll be wishing to buy the title for the campaign only, and for those who’re looking primarily to spend their time in the mutliplayer component of the game, there are other decisions you’re going to need to make. While it’s true the X1 version runs at a lower resolution, other factors such as your friends list on both machines (and even your preference on say the controller) are likely to be the bigger factor here. Overall, both console versions stack up rather well against each other. 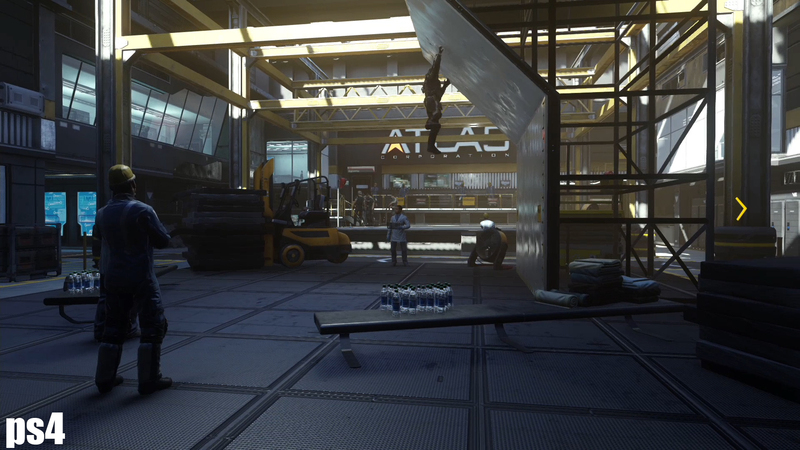 Textures, lighting, shadows and models are all pretty interchangeable. The Xbox One does have LoD (Level of Detail) issues at distances, and the occasional bit more pop-in, but it’s very subtle. Much of this is likely down to the so called Dynamic Resolution. If you’re yet to purchase Call of Duty Advanced Warfare on either next generation system, there’s certainly an argument to be made that the PS4 version is slightly superior. But, with such close parity in most of the assets, and with no real differences in say Texture Filtering (which we’ve seen previously in say Thief), it’s really the Dynamic Resolution that lets the Xbox One down. I would argue that the versions are close enough to each other to really boil your decision down primarily to your choice in platform, rather than for any other purpose. 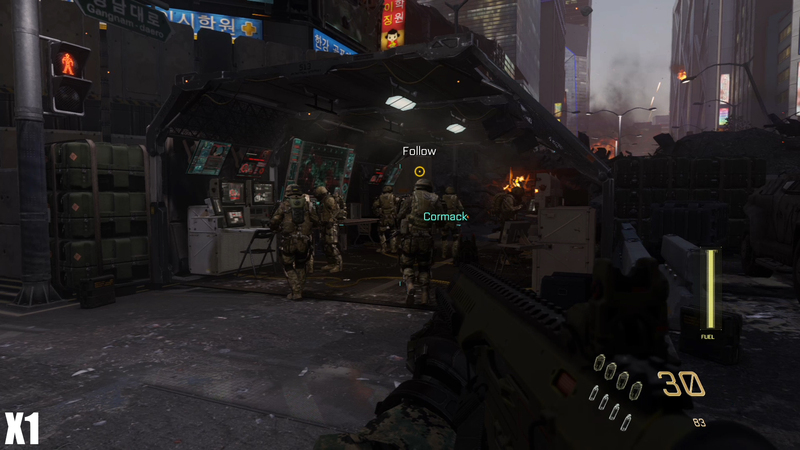 What Sledgehammer have achieved for the consoles is impressive, but after playing around a bit with the PC version of Advanced Warfare, it’s hard to not feel more could have been done for that version. While we’ll have our comparison soon, our early findings are that the PC version isn’t really that much different from the consoles. Of course, you do get to run at higher resolution, frame rates and do have nicer reflections, lighting and of course Anti-Aliasing. 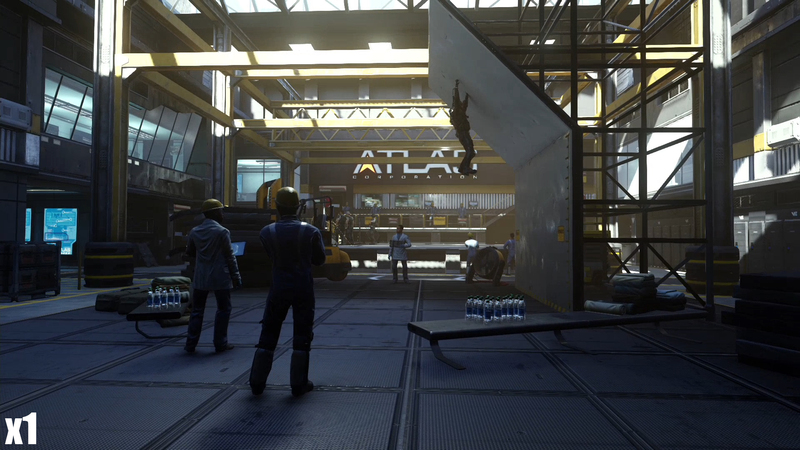 Call of Duty Advanced Warfare provides a compelling demonstration what the next generation systems are capable of. While the title isn’t the most graphically impressive available on either system, there’s few who’d deny the frankly massive leap forward compared to the let down that was Ghosts. The Playstation 4 version wins the resolution game, but kudos must be given for having the Xbox One version so visually close. Because shadows, lighting, textures, models and other assets are interchangeable between both versions, it’s really a case of swings and roundabouts. What’s more important to you? Higher resolution in campaign, or better performance? For the online, things are a bit trickier, and we’ll tackle the frame rate issues soon, but online both consoles perform very similar. The resolution therefore of the PS4 might be enough to sway you for the online component, but other factors including: controller, friends list, console of preference and even down to if you prefer PSN or Xbox Live probably will mean more in the long run. 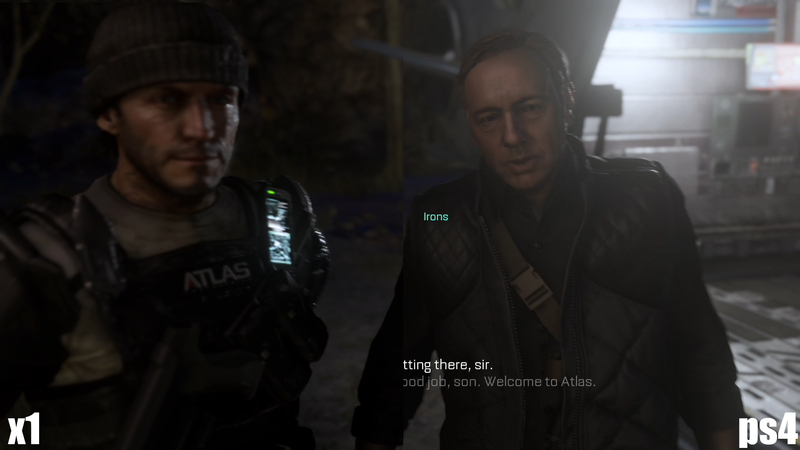 Buying the Game – pickup call of duty advanced warfare using this link to help provide us a few pennies to run the website please! 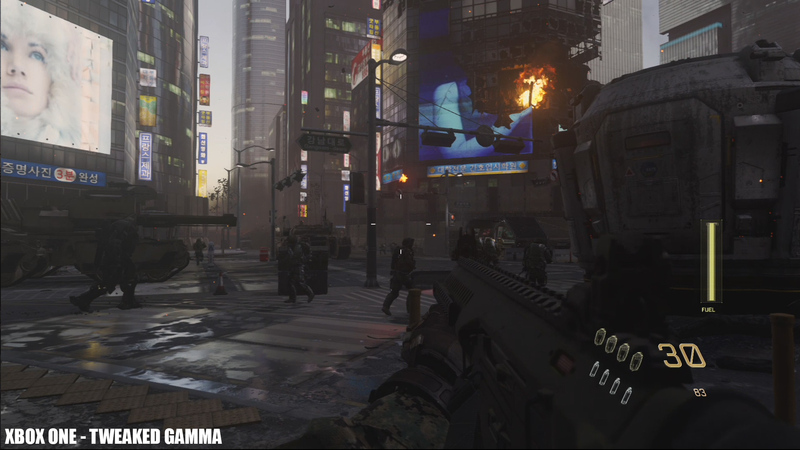 A frame-rate and graphics comparison for CoD AW on both the Playstation 4 and the Xbox One. It's war, but it's advanced. 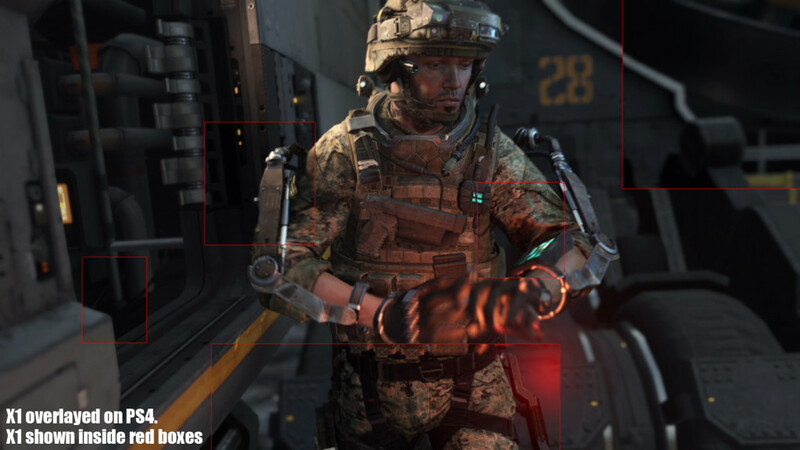 Tagged with advanced warfare, call of duty advanced warfare, COD, graphics comparison, playstation 4, ps4 vs x1 call of duty, Tech Tribunal, XBox one.